For this week's Peachy Keen Challenge, it was a color inspiration. I admit, I was stuck in fall/halloween mode so this really threw me for a loop! So, I had to switch gears and makes this a holiday themed card. This is the color palette I had to work with. I didn't use all of the colors, but I tried! Check out what the other DT members did for the challenge at the PKS Blog HERE. The other girls didn't seem to have the same problem I did with using the colors! 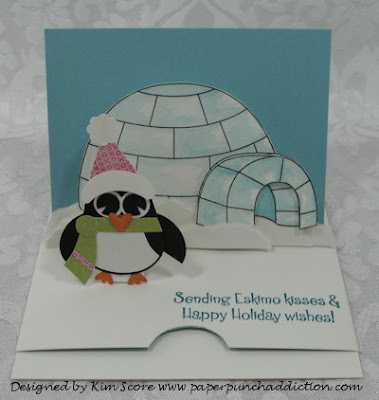 I used the PKS-11 Igloo stamp set. The penguin was created using the Owl Builder punch (just cut off the tufts at the top of the head and use the small oval cut in half for flippers). It's been a long time since I created a Sliding Pop Up card. If you would like to tackle this style card, check out my step by step tutorial HERE. I did modify this card a little for double pop up. The wrap is 2-1/2" wide instead of 1-1/2". Did you see all of the awesome new Peachy Keen Stamps that came out yesterday? If not, head over there and check it out! A special discount on all of the new stamp sets! Very cute....kind of hard to get in all the challenge colors for an Ice based card....great! I can't go past how you have done the wee eyes Kim!!! This is v v cute Kim...cracking job. Great take on the color challenge. Love this sweet card. so cute, will be making this for my son's birthday. Thanks for sharing.